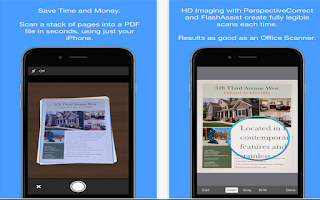 Smart PDF Scanner is an excellent app that allows you to scan documents and send them as PDFs or images. The app is free today and only for a limited period of time. Its regular price is $2,29. The way Smart PDF Scanner works is simple and easy: you simply snap a photo of your document using your iPhone or iPad and choose the format you want to send it in. Place your document on a darker surface to improve the edge auto-detection. You can drag the corners of the blue rectangle to fine tune it after taking a photo. Make sure there is adequate lighting. Use the flash in low-light conditions. Smart PDF Scanner also enables you to organize your scanned documents using a simple tagging system with custom colour coded categories so you can easily browse and find your docs. There are different ways to share your scanned docs. You can email or print directly from the App, share them via AirDrop or upload them to cloud services such as Dropbox and Google Drive.